My daughter has picked up many a book (from my children’s book collection that preceded her birth) that was too long or complicated for her present age and insisted that I read it to her. 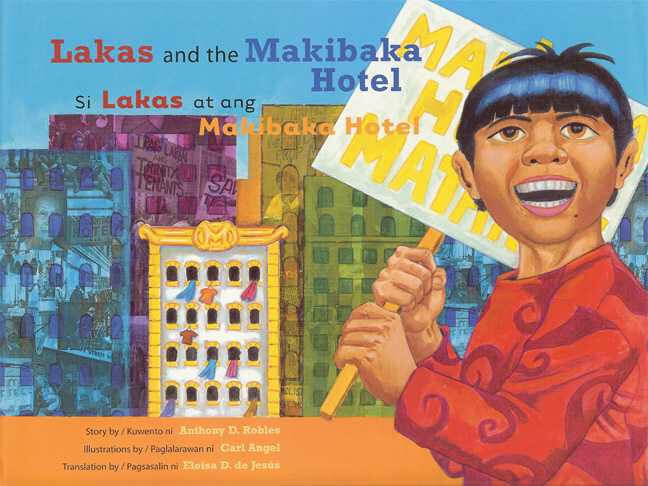 One such book is Lakas and the Makibaka Hotel—a book about a young boy, Lakas, who helps his neighbors fight eviction—which I “read” to her in a modified way when she was two-years-old. Oftentimes, this line of conversation leads to my daughter voicing a fear that someone could “kick us out of our apartment”—in our case, I have the class privilege to reassure her that this will not happen. I have yet to define the word “gentrification” for my daughter which feels complicated (for a four-year-old). And on this particular day, when I am in the middle of watching “The Big Short” a movie about the collapse of the housing market, I am feeling rather depressed about my personal power to change anything. But what I do know is that I want my daughter to question what and who was in a particular place prior to the people and buildings she sees before her eyes. I was recently flipping through the table of contents and index of a huge coffee table book about Central Park which has no mention of Seneca Village, the neighborhood that existed within the present-day footprint of the park—a neighborhood which happened to have had the highest level of land-owning African Americans in New York City at the time—and which was destroyed by the park’s construction. How else will she be an ally to and advocate for the fair treatment of people who happen to be “there” before change displaces them? In light of this post’s theme and my post-The Big Short depression, I once “shared” a very concrete and easy-to-understand post on my personal Facebook page about the 1%’s role in profiting off foreclosures in the housing market. This post later mysteriously disappeared from my Facebook feed and I could not re-locate the article. If anyone has come across a similar resource, please share in the Comments section below. Also, a neighbor recently shared with me that in visiting the municipal buildings in downtown Manhattan to check on her family’s property, she encountered people who are paid full-time by high net worth individuals to scan municipal records day in and day out, looking for “opportunities” in the housing market. Although this reality was not surprising, the concreteness of a person’s “job” being to scan these records (which despite their being public records, sounds mildly illegal) was not something I was aware of—and like it would be a good “story” for someone who writes about this type of thing. Just putting it out into the world and hoping someone will write this story. Sachi Feris is a blogger at Raising Race Conscious Children, an online a resource to support adults who are trying to talk about race with young children. Sachi also co-facilitates interactive workshops/webinars and small group workshop series on how to talk about race with young children. Sachi currently teaches Spanish to Kindergarten and 1st grade at an independent school in Brooklyn. Sachi identifies as White and is a mother to a four-year-old daughter and eight-month-old son. Respectful comments only, please. Blog authors are sharing personal conversations with their children in order to create an online resource for ongoing conversation. Comments that, at their core, simply disagree with the basic premise of Raising Race Conscious Children, will not be approved as we are committed to building a space for parents and educators who want to talk about race with their children. Remember—no single blog post speaks to every concern about a particular topic. Be mindful that some blog posts reflect conversations that take place in a private setting (as opposed to a public setting). The words one uses in the privacy of her/his home versus in public may sound different.